A smaller growing Crepe Myrtle. Enduring Summer will give that bubbly vivid colour and impact without the tower height of a full tree. This makes it the ideal choice for informal hedging and group plantings. Use it to tier under and around larger crepe myrtles and it’s a excellent performer in container plantings. Flowering commences early in the summer and it will continue right through to autumn. The early spring foliage is a warm welcoming red and turns to glossy green as the leaves allow the flowers to take centre stage. 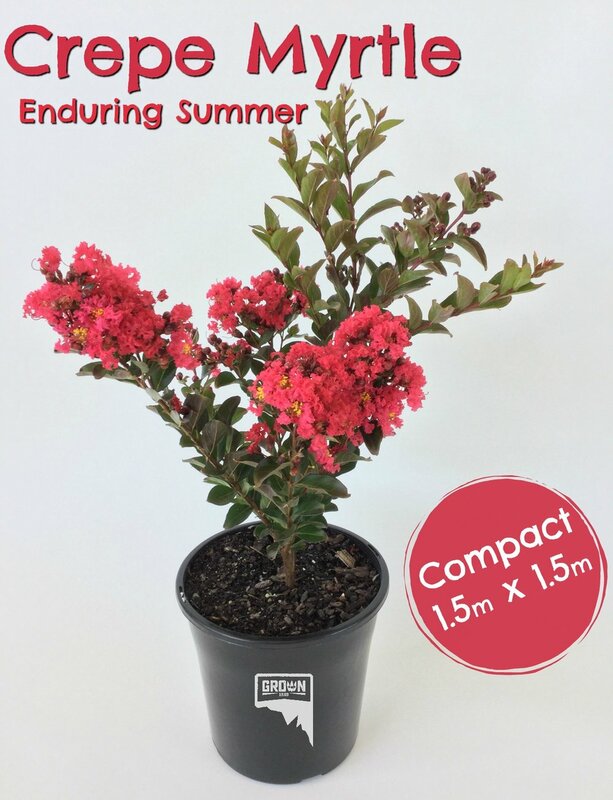 Super hardy, Enduring Summer is a delightful version of a South Australian favourite, the Crepe Myrtle. Tolerates heat and dry, deciduous and arty looking over the winter. A really popular and loved grass, as it is so striking. Planted en masse, swathes of luscious maroon blades form elegant and graceful clusters that will move and shiver with the slightest breath of a breeze. Plumes feathery and rosey coloured create interest and delight these long fluffy (flowering) wands, arch and wave from the body of the grass. This pennisetum is safe to plant as it is non invasive it’s quick to establish and looks fabulous in the garden, in pots or in huge plantings and makes big impact! Keep the water and tucker up to while it’s establishing and then it’s pretty well set, for fun and garden enjoyment. Waves of purple colour. It’s large luscious lettuce like leaves are sturdy and the plant resilient. Once flowering begins in the late spring it will continue through the months while the weather is warm. The Limonium is a small growing clumping plant, when flowering it will be about 300mm high. It works beautifully in group plantings and is complemented well with greys and pink colours. It looks amazing planted with Cotelydon and Erigeron spindrift. Use it to edge borders, fill spaces and containers. Sea Lavenders are loved by butterflies, it will bring them to your summer garden.